1) Head torch – hands free and always pointing where you turn you head to – blinding when you look directly at someone! 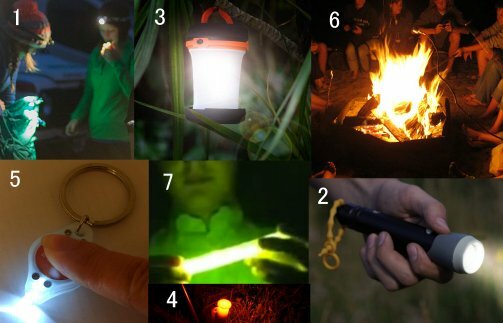 2) Hand torch – the classic point anywhere light, can be a little awkward when you need to use both hands for something like tying a shoelace. Most forms of lighting now use LEDs in place of battery sapping bulbs, this allows for smaller batteries and reduced overall size. The down side to standard LEDs is that they do not focus light over a long distance. Some of the newer, high power, surface mounted LEDs (known as SMDs) can overcome this issue while still using far less energy than bulbs.